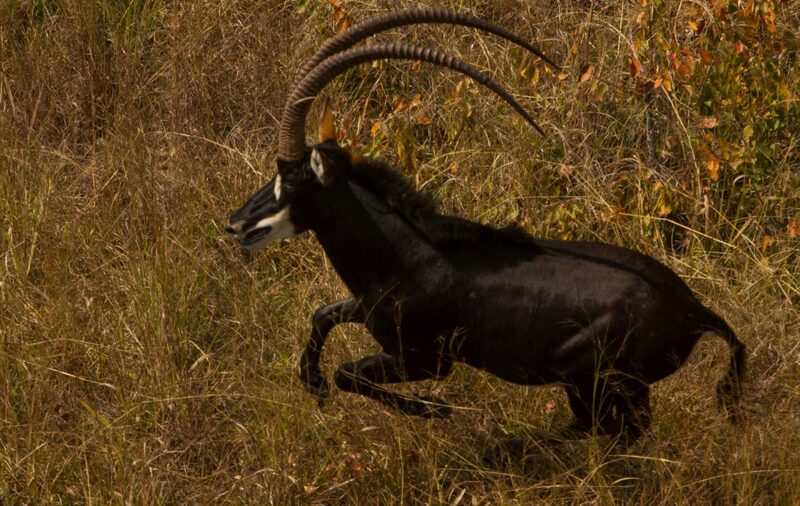 The giant sable is a particularly rare subspecies of the sable antelope. Males and females both have horns and are similar in appearance until full adulthood, when the males become darker and their horns grow even longer (up to 1.5m). Most individuals have white eyebrows and cheek stripes and females and young are chestnut brown. While there is no data on giant sable, other sable subspecies can live up to 20 years. Critically endangered. From a population of 2,000 in the 1970’s, perhaps fewer than 100 individuals remain. Endemic to the forests of Angola, where the giant sable is the national symbol. They favour forests near water. Giant sable antelopes typically feed on tree leaves, especially those growing on termite mounds and growing close to the ground. Such a specialist diet may also be a factor in their decline. The giant sable is threatened by illegal hunting for meat, Illegal capture and transport for wildlife ranching, and also hybridisation with the closely related roan antelope Hippotragus equinus. Angola’s Luando Reserve and Cangandala National Park are the two key strongholds for giant sable. The Giant Sable Conservation Project has constructed a fenced sanctuary in the latter, and is working to re-establish viable wild populations from the park’s few remaining animals.